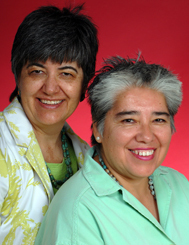 Abrego and Welch live in Oak Park and support various LGBT causes. Abrego is a long-time Chicagoan also known for her poetry. Abrego works in youth leadership development, and Welch works on charter school development. Abrego has been a volunteer with LLENA and Chicago Women in Trades, and co-founded the International Women's Day Dance.